notes from eleanor bloom: What's that Lassie? Jimmy's got a bomb? What's that Lassie? Jimmy's got a bomb? Dog driving you bonkers? Needs to be active every day and taken for a walk? Can jump a fence, and "loves food"? What a pain in the arse! 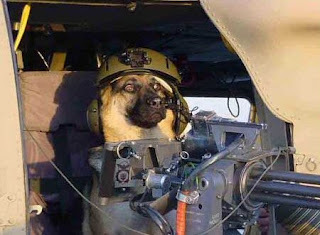 Get rid of Enlist your mutt today! Australia needs your chihuahua! It may save the world! People struggling to cope with a hyperactive dog are being urged to think about giving up their pet for the sake of the country. Sydney dog training centre Hanrob has launched a national recruitment drive to find animals fit to undertake security work in Australia and overseas. Hanrob managing director Andrew Biggs says the centre is particularly interested in young beagles and labradors, aged between 10 months and three years, who like to rip up backyards, jump fences and love food. Mr Biggs says the program is ideal for families who can no longer cope with their dog's high energy and destructive behaviour. The dogs will undergo an intensive three-month training program that includes learning how to detect illegal materials. Once completed, five dogs will head to Hong Kong and two to Japan to help strengthen efforts against diseases like bird flu. The rest of the dogs will find employment in Australia. UPDATE 12 Oct: Just saw this news item. It may be a good example of why they're looking to use dogs... and not cats.